The aim of this project is to understand and evaluate how policies and trends in the airline industry impact passenger delays in the US National Aviation System. In particular, we are investigating the USDOT Tarmac Delay Rule, which went into effect in April 2010, as an effort to curb lengthy delays during the taxi-out and taxi-in phases. In this work we attempt to analyze the effectiveness of the rule from a passenger-centric point of view. 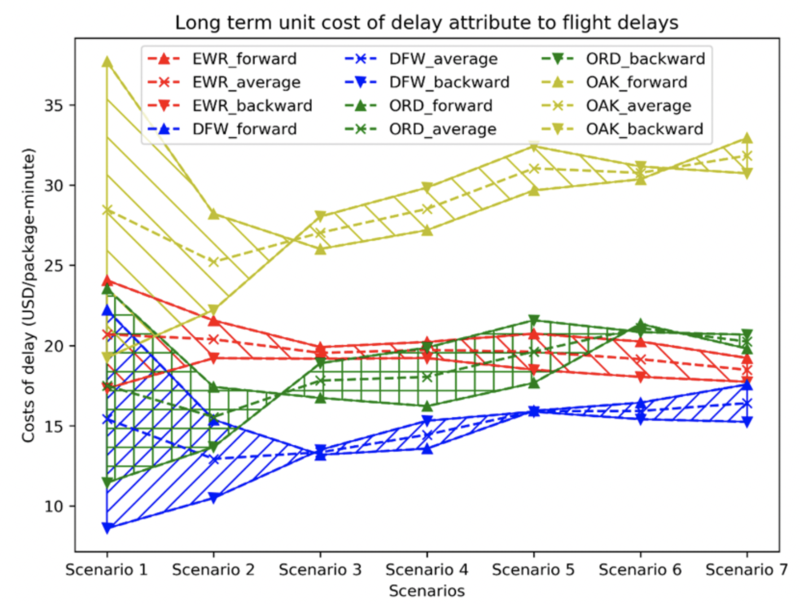 Using the Passenger Delay Calculator, developed at MIT, and testing a range of assumptions on cancellation decisions by airlines, and passenger re-booking times, we perform sensitivity analyses using USDOT data from 2007 and one quarter of booking data purchased from a large legacy carrier to validate the model. As of now, we have obtained passenger delay results for several days in 2007 assuming hypothetical scenarios where the tarmac delays rule existed for those days; the same analysis will be performed on days in 2006 and 2008-2011 once purchased itinerary data for those years becomes available. The results suggest that while the rule has been a highly effective deterrent for airlines to keep tarmac times under three hours, passengers are faced with the tradeoff of foregoing long tarmac delays and enduring cancellations and rebookings, or experiencing longer tarmac delays but shortened delays in arriving at their destination. High oil prices continue to be a problem for all aviation users. This projects attempts to understand the overall economic impacts of oil prices to commercial aviation including passenger, cargo and general aviation users. The project also studies how oil prices impact air traffic control operations and air traffic management policies. Specifically, Virginia Tech has developed a series of statistical and life cycle cost models to evaluate the impact of oil prices on general aviation users. UC Berkeley is doing the same for cargo operators and MIT for commercial operations. Virginia Tech is also developing national level economic modeling tools to understand the impacts of oil prices into the economy. Virginia Tech has briefed the FAA and GAO on the models developed and is sharing data sources and information with GAO as they study similar impacts by a Congressional mandate. The models developed will be used by FAA to direct investments analysis and policies. The Federal Aviation Administration is engaged in a comprehensive overhaul of Air Traffic Management (ATM) and the National Airspace System (NAS) known as NextGen. NextGen promises to enhance the safety and reliability of air transportation, to improve efficiency in the NAS, and to reduce aviation’s impact on the environment. As part of the investment planning process for NextGen a large number of cost-benefit analyses and trade-off studies need to be performed, to better allocate the limited resources available and to justify the program to Congress and other aviation stakeholders. When conducting such studies the FAA uses models of the NAS, and estimates flight delays, fuel burn, cancellations, and other relevant operational metrics with and without particular investments, technologies, and procedures. The differences in the values of these metrics are then converted to economic terms to facilitate comparisons with the costs of implementing the technologies and procedures. Much research has been performed into the cost of delay on airline operations. One way to value the cost of delay is by using aircraft direct operating costs (ADOC). A great deal of data already exists on ADOC for all types of commercial aircraft, used for both passenger and cargo service. In addition to ADOC, when passenger flights are delayed, these delays can also be assigned an additional cost based on their impact to passengers, using Department of Transportation (DOT) guidance on passenger value of time (PVT). Unfortunately, a similar concept does not exist for cargo flights, even though we believe that there is a “business cost of delay” for these services. For overnight package services such as UPS and FedEx, if packages arrive sufficiently late to their hubs, then they can miss the “sort.” This means that they likely will be delayed an entire day, until the next evening’s sort. Because these operators offer on-time delivery guarantees to their customers, large delays may have significant consequences, while small delays may have very little impact at all. The FAA requires research into means to estimate the cost of delays to operators such as UPS and FedEx. UC Berkeley will study the magnitude and impact of delays on overnight and other cargo carriers. They will identify ways to estimate package delays using flight segment data such as that available to the FAA from operational databases and produced by NAS-wide simulation models. Additionally, they will investigate the business costs incurred to the carriers as a function of the lateness of the shipments. Flight delay is a severe and widespread problem in the U.S. There have been numerous studies on the cost of delay to airlines, passengers, and society. Unfortunately, a similar concept does not exist for cargo flights. As overnight flights play an important role in the “Next Day” service provided by most main carriers, the FAA requires research into means to estimate the impact of flight delays to the cargo and package carriers. This study focuses on two pieces of analysis to fulfill this goal. First, we estimate a mixed-logit model to quantitatively investigate the factors that influence late deliveries, with specific emphasis on flight on-time performance. Then we conduct hedonic analysis to monetize the loss of late deliveries, using multiple regression techniques to estimate the degradation in product value resulting from less reliable on-time package delivery. Estimates of flight delay costs for four representative US airports range from $8,000 to $38,000 per flight-hour, with an average of about $20,000, which is roughly three times the direct operating cost per block-hour for air cargo flights estimated by GRA (2007), and also much higher than the unit flight delay cost related to passenger delay. A major challenge in achieving the Next Generation Air Transportation System (NextGen) is insuring that appropriate investments in new technologies are made on both the part of all relevant stakeholders. The general concept of Best-Equipped, Best-Served (BEBS) directs immediate operational benefits to flight operators when equipped aircraft of brought into service. Under this project, new resource allocation methods were developed for ground delay program planning under a scenario in which equipped aircraft provided access to additional arrival capacity during reduced visibility conditions. The specific case study considered involved the introduction of GBAS-equipped aircraft at Newark Liberty International Airport (EWR). The research explored three alternate methods for directing benefits to equipped aircraft. These differed in the manner in which secondary benefits were handled and also the degree to which the delay performance achieved by non-equipped aircraft might be degraded. This work not only resulted in new resource allocation methods but also defined and investigated relevant policy questions. A paper summarizing this work was presented at the 9th USA/Europe Air Traffic Management R&D Seminar in Berlin in June, 2011and won the Best Paper Award in Economics and Policy. This project constructed and analyzed multiple datasets and developed related models in order to estimate the total impact of flight delays on the U.S. economy in 2007. The cost components analyzed included cost to airlines, cost to passengers, cost of lost demand, as well as the indirect impact of delay on the US economy. 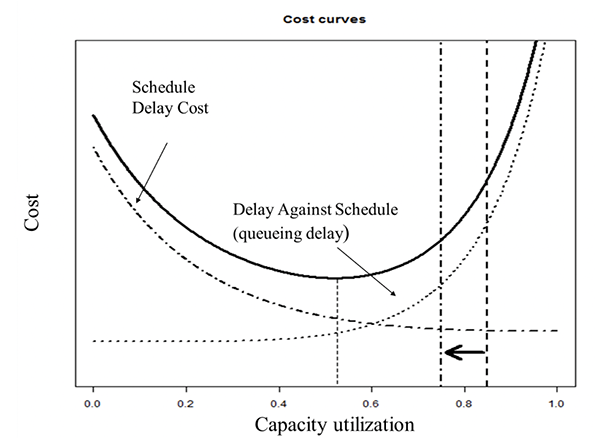 This study offered a broader consideration of relevant costs than conventional cost-of-delay estimates, and employed several innovative methodologies for assessing the magnitudes of these costs. 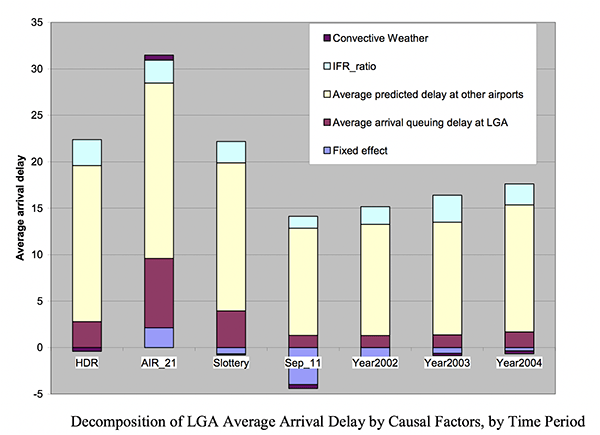 Of particular note were the passenger delay cost estimates, which recognize that flight cancellations and missed connections can lead to substantial passenger delays not revealed in traditional flight delay statistics. The TDI project team estimated that the total cost of all US air transportation delays in 2007 was $32.9 billion. The $8.3 billion airline component consists of increased expenses for crew, fuel, and maintenance, among others. The $16.7 billion passenger component is based on the passenger time lost due to schedule buffer, delayed flights, flight cancellations, and missed connections. The $3.9 billion cost from lost demand is an estimate of the welfare loss incurred by passengers who avoid air travel as the result of delays. In addition to these direct costs imposed on the airline industry and its customers, flight delays have indirect effects on the US economy. Specifically, inefficiency in the air transportation sector increases the cost of doing business for other sectors, making the associated businesses less productive. The impact here is subtle, however. For example, the airline industry would actually employ fewer people as it becomes more efficient. The overall impact, of course, would be positive. The TDI team estimates that air transportation delays reduced the 2007 US GDP by $4 billion. Team: The Brattle Group; George Mason University; Massachusetts Institute of Technology; University of California, Berkeley; University of Maryland; Virginia Tech. PI: Mark Hansen (UCB). CoPIs: Michael Ball (UMD), Cynthia Barnhart (MIT), Martin Dresner (UMD), Kevin Neels (BRT), Amedeo Odoni (MIT), Everett Peterson (VT), Lance Sherry (GMU), Antonio Trani (VT). Researchers: Rodrigo Britto (UMD), Doug Fearing (MIT), Prem Swaroop (UMD), Nitish Umang (MIT), Vikrant Vaze (MIT), Augusto Voltes (UMD), Bo Zou (UCB). The goal of the project was to propose and analyze congestion management alternatives to be used in place of the High Density Rule, which was set to expire in January of 2007. The scope of the project included the analysis of several administrative measures, congestion pricing options and slot auctions. A major deliverable of the project was the design and analysis of a mechanism for auctioning airport arrival and departure slots. To carry out its research the project team conducted two strategic simulations. These were multi-day events that included the participation of airport operators, most notably the Port Authority of New York and New Jersey, FAA and DOT executives, airline representatives and other members of the air transportation community. The first simulation, conducted in November of 2004 at George Mason University, placed participants in stressful, high congestion future scenario and then allowed participants to react and problem solve under various administrative measures and congestion pricing options. The second simulation, conducted in February of 2005 at the University of Maryland, was a mock slot auction in which participants bid on LaGuaria arrival and departure slots for fictitious airlines. The project team delivered to the FAA and DOT a “toolbox” of congestion management options that included both market-based and administrative alternatives. These were represented in a way that allowed for the government decision-makers to build a complete solution from components based on policy goals. As part of the project the team investigated the environment at LaGuardia airport and were particularly attentive to particular LaGuardia needs and constraints. Extensive simulations were carried out that analyzed the impact of varying traffic levels and fleet mix. 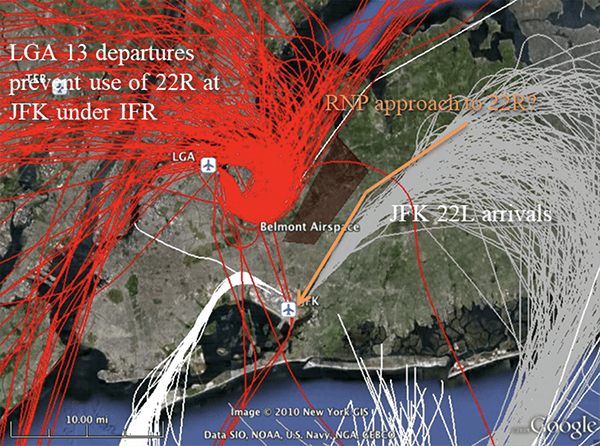 Recommendations were also developed to address issues related gate and terminal leases and other explicit and implicit airline rights to LaGuardia resources. The project resulted in multiple proposed and final rule makings.